This medium size antique Naga Singing and Healing Bowl has a middle octave F# (364Hz) fundamental when struck or played with a suede ringer, and a fifth octave B (990Hz) when played around the rim with a wooden one. It’s a very responsive bowl and easy to play. 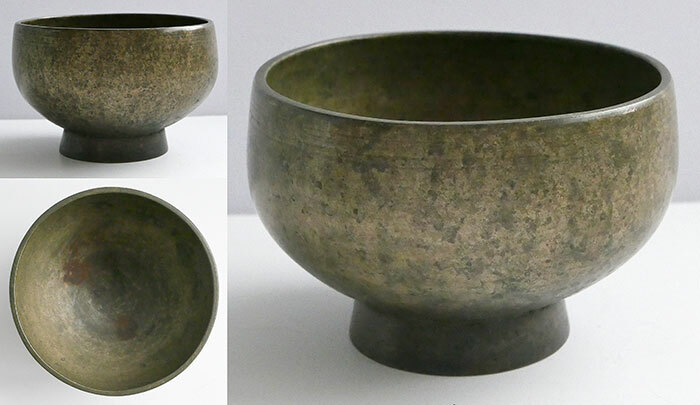 This is a fabulous example of this bowl form, and in perfect structural condition. It also has the most beautiful antique patina and colour acquired over a lifetime of service.